Two figure skaters shine, while two basketball stars get sent home on week 2. It was a night full of improvements, a few perfect 10s and two sports-themed group dances, but week two of "Dancing with the Stars: Athletes" wasn’t a slam dunk for two unlucky contestants. After the judges' scores were tallied with America’s live vote, NBA legend Kareem Abdul-Jabbar and Notre Dame basketball star Arike Ogunbowale were sent home, along with their respective partners, Lindsay Arnold and Gleb Savchenko. Abdul-Jabbar and Arnold joined "Good Morning America" today to discuss their short-lived time in the ballroom and offer his prediction for who might take the whole competition. "I was very glad that I was able to execute the dance, Lindsay did such a great job preparing me," he said. "I just was hoping my father, wherever he is, was looking down because he always enjoyed dancing and music, so I'm sure he participated wherever he was." Arnold, who danced while perched atop another person's shoulders to match her 7'2" partner, said, "I thought it would only be fair to Kareem to finally have a dance partner his size and it was so much fun." The retired NBA star revealed Olympic figure skaters Adam Rippon and Mirai Nagasu as his top two picks for the finals, "because they do it every day." "They['ve] got a great presence on the dance floor and their execution of all the moves was impeccable and I think they're going to go on and push into the end," Abdul-Jabbar explained. 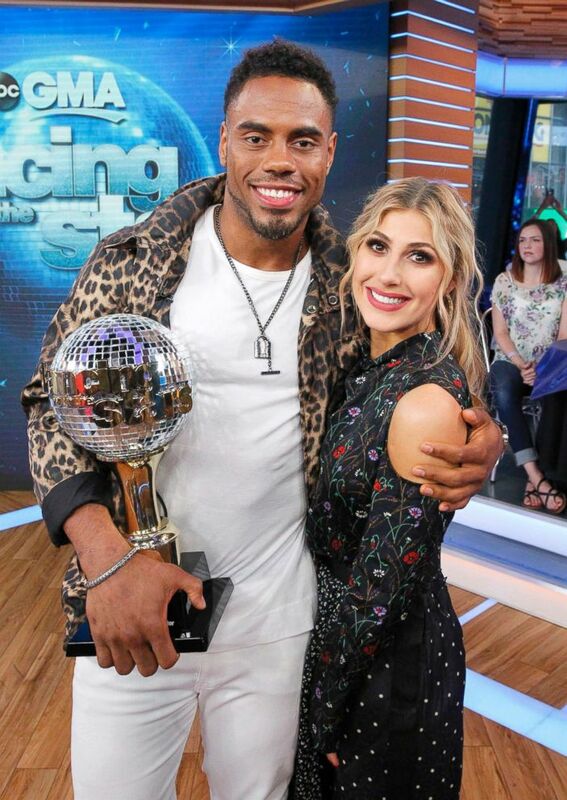 Former NFL running back and season 24 "Dancing" mirrorball champion Rashad Jennings told "GMA" that being back in the ballroom last night as a judge "was so much fun." "I went back to my season as I'm watching all the contestants putting all this energy into a dance and a routine and I've been there before," Jennings said. "Now I can actually critique and give positive reinforcement to where they're at." (Lou Rocco/ABC, FILE) In this file photo, Rashad Jennings and his partner Emma Slater at the "Dancing with the Stars" after party on "Good Morning America," May 24, 2017, airing on the ABC Television Network. Jennings, a newly published first-time author of "The If in Life," said he thinks Olympic luger Chris Mazdzer, NFL cornerback Josh Norman or Olympic softball pitcher Jennie Finch will "slip into the final two or three." And although Mazdzer and partner Witney Carson rounded out the bottom three on Monday night, the pair were declared safe. On the plus side, the judges -- including guest judge and former "DWTS" champ Rashad Jennings -- all saw positive changes in the athletes from last week. The night belonged to figure skaters and pals Adam Rippon and Mirai Nagasu, who tied for the best scores of the night with 37 out of 40. Once the partner dances were complete, the contestants grouped into teams: Team '50s Tennis and Team '70s Football. As seen the rehearsal footage, practicing an extra dance proved challenging for these busy athletes. Josh had to run off for football practice and Arike had to leave early for college finals. The team scores were added to the individual scores, then combined with viewer votes to determine who was safe and who went home. "Dancing with the Stars" returns next Monday night on ABC.